Barcelona, the city of Gaudí, is one of Spain's most modern cities for good reason, hosting major technology exhibitions like Mobile World. Not everything is focused on the future, though; history and culture are essential to understand its people. 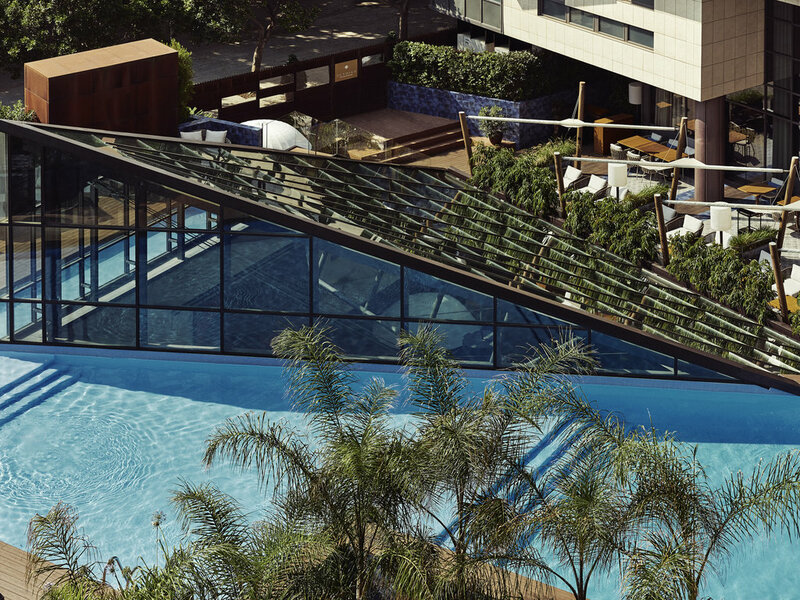 The Pullman hotel is located opposite Barceloneta beach, the best-known in the city, and a few minutes' walk from the Gothic Quarter, one of Barcelona's main tourist attractions. The hotel is also well connected to the airport and train station. Beach location and great beds & breakfast! The beds and pillows were probably the best I have experienced in any motel...they were awesome! The staff were extremely helpful, friendly and accommodating. The location is right on the beach and near the port with lots of restaurants options. Breakfast is great with lots of different choices and fresh ingredients. We had a wonderful stay. Great location, excellent service and amazing F&B! Friendly, attentive staff in all areas of the hotel. Mum and daughter visit. I have stayed before, my daughter has not and she loved it as much as I do. The staff were attentive and helpful, particularly Tiago at reception (I hope I have remembered his name correctly) and Manny at the bar. All staff are pleasant and helpful. Have stayed several times. Rooms very good ineed. We were disappointed with the quality of reakfast on this vsit. The eggs station was very good but the quality and choice of fruits and pastries was much lower than on previous visits. The hotel has good location and good size and potential of the facilities. Rooms are big and well equipped. Reception staff are polite and helpful. Restaurant area staff never smiled, not even once in 5 days, everyone looked very busy and quite unhappy. My plate was pulled out of my hands when I wanted to put more food in it, and I was forced to take a new one as this was &quot;restaurant policy&quot; not to use 1 plate 2 times. I had to wait every morning for coffee because it was served by waitress who was always busy and when I poured it myself I received some angry looks. Food average quality. In the room, my soap, shower gel and shampoo was taken on the second day and exchanged with new even that they were barely used. No care about the environment. Room needed some technical maintenance as some of the items were falling/broken. The hotel staff was wonderful, however the room needs some updates. The bath tub needs to be replaced and so does the sliding door. Also for several days there was strong sewer smell in the bathroom. My only complaint and it’s quite a big one is the bathroom in the room I stayed in is not very good suitable for wheelchair users. Could not get my wheelchair under the sink for washing and brushing teeth. The Toliet is too low, the floor was very slippery when wet and the shower was not suitable for disabled people at all. Other than that, everything was 10/10, great customer service, friendly staff and the bed was super comfy aswell. Great location. Friendly, professional staff. The hotel ambiance is attractive and overall experience was good. Beautiful Hotel in beautifu city. The reception desk was very helpful and kind giving us a map and explainations of sights and restraurants when we arrived. The bell hops hailed cabs for us and helped with addresses. The room was lovely. Our real concern was the beautiful bathroom with a tub and shower. The shower floor was extremely slippery with or without soap products. There was nothing to grab onto should one start to slip. I think this is a safey issue for your hotel no matter what age the clientelle. It's an Accident waiting to happen here with shampoo/conditioner use in shower. The glass on the shower floor is dangerous. Our reservation was made through Costco as an Executive member that included a welcome drink. In no way did we expect water to be our welcome drink. A bottle of Perrier and some other type in a Blue bottle. This only added to the already two very nice bottles already available to us as water options. Very surprising to us is that the welcome drink was not a drink from the beautiful bar or small bottle of wine. Our reservation also included breakfast and it was absolutely wonderful! Large selection of beautifully dispayed breakfast foods to choose from and a made to order egg station. It was perfect for travelers. We enjoyed our stay very much. Thank you. Arrival experience average. No explanation about anything, including facilities and services. Room service food was poor compared to other 5 star hotels I stayed at in barca. Amazing with the new look. But the rooms and corridors need an overall revamp. Unfortunately, except from the bar staff (and Jeremy was excellent), the hotel has been a big disappointment. The key cards NEVER work in the lifts, it sometimes takes a few minutes to open your room too. The room was clean but I had to tell staff to send someone up as there was a big hole in the wall by the bath tub through which you could see the pipes...I also had to call someone to put the shower on 30 degrees as it was so hard I couldn't turn it myself. The food and drink were overpriced (19Euros for a G&T, which isn't even free poured, is excessive even for the UK...). On the last day I asked for late checkout but they still called me to leave the room at the standard time as it hadn't been communicated to the day staff. The wifi kept cutting every couple of minutes. On the days of congress, breakfast wasn't served till 7am! So I never got to have any, which was included with my room. All in all, not a 5-star experience.